A few years ago, I was sitting at a table with some of the best Tarot readers in Australia. We were chatting casually about the Tarot and how we love to connect with the cards. But then the topic of reversed Tarot cards came up and the mood changed completely. The whole table of Tarot readers were dead set against using reversed Tarot cards in their readings. You see, I LOVE reversed Tarot cards. They bring an extra layer of depth and insight to my Tarot readings that I can’t get from upright cards. But, I also understand why these Tarot readers were avoiding reversals like the plague. Look up a reversed Tarot card meaning in a Tarot book and you’ll often find words like “betrayal”, “deception”, “treachery”, and “manipulation”. Not exactly the kind of vibe you want to give your Tarot readings, right? 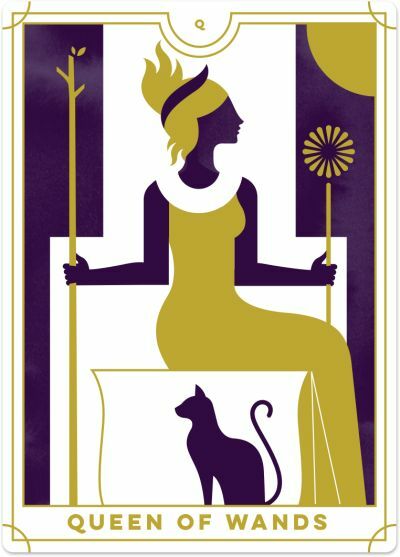 So why do I LOVE reversed Tarot cards when many Tarot readers do not? Because the way I read with reversals is very different to how many other Tarot readers read reversals. 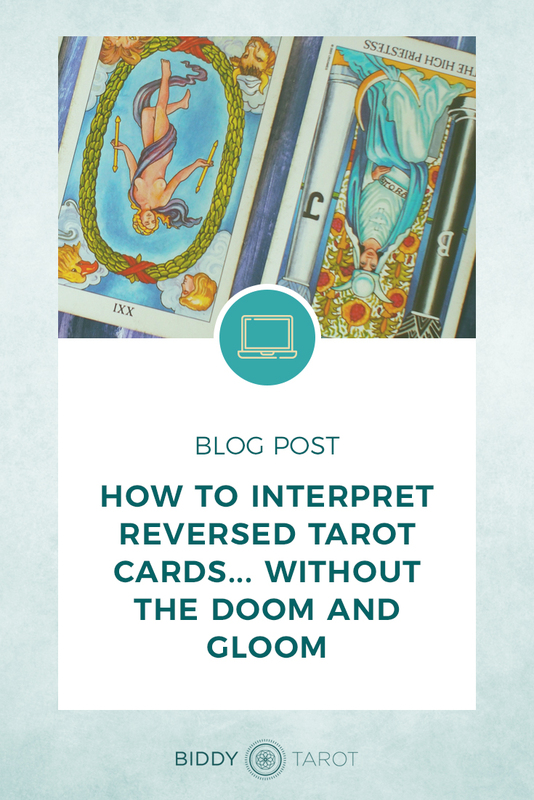 In this blog post, I’m going to show you how to interpret reversed Tarot cards, without the doom and gloom. 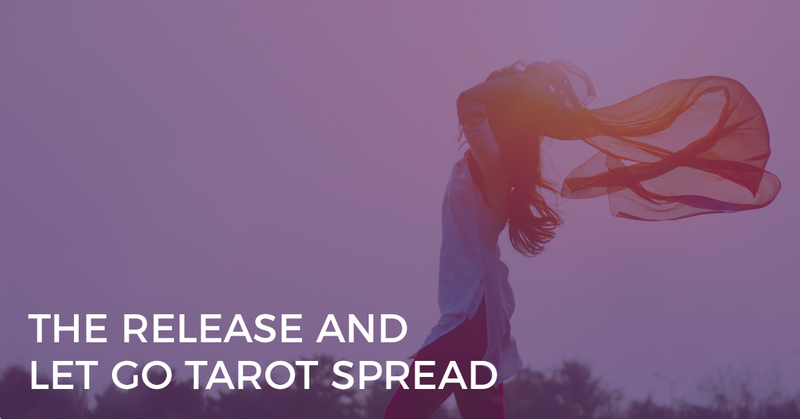 If you’ve avoided reversed Tarot cards in the past, today’s the day to breathe new life into reversals and use them in positive and empowering ways in your Tarot readings. Why Read With Reversed Tarot Cards? If you’re a Tarot beginner, you might be wondering why on earth you would want to read with reversed Tarot cards and double the amount of information you need to learn to become a good Tarot reader. I get it – I totally do. But here’s the thing. You don’t have to learn another 78 Tarot card meanings to master reversed Tarot cards. You can double your insight and expand your understanding of what the Tarot cards mean for you in a reading. You can see the light and shade of a situation and identify where to release any blocks. You can delve into what’s happening within you versus what’s happening around you – perfect for knowing where to make the most impactful changes. And you can even get a simple Yes or No in your Tarot readings. Do you have to read with reversed to be a good Tarot reader? However, reading with reversed Tarot cards opens up a whole new layer to your Tarot readings and provides the opportunity to go even deeper with your intuitive insights. 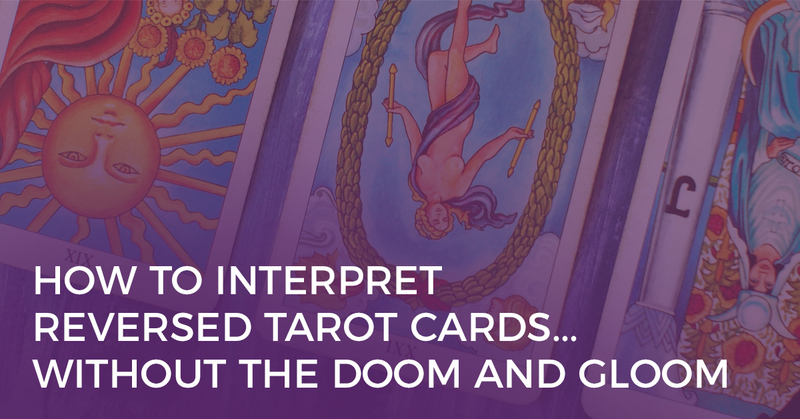 Here are 4 of my all-time favourite methods for interpreting reversed Tarot cards. They offer a balanced perspective – not all ‘doom and gloom’ but not all sugary-sweet either. They serve to empower the client. They are simple to learn and apply in your readings. These are the exact same methods I use in my personal and professional Tarot readings, and that I teach to my students in my Tarot training courses. At the heart of it, Tarot cards are energy. Each and every card is an expression of energy in its many different formats. 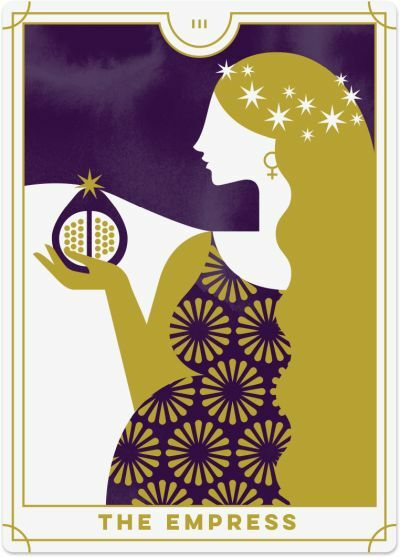 For example, the Empress is an expression of abundance, fertility and the mother energy. When we encounter the Empress in our everyday lives, we might experience her energy as nurturing and taking care of others or successfully bringing a new project to life. 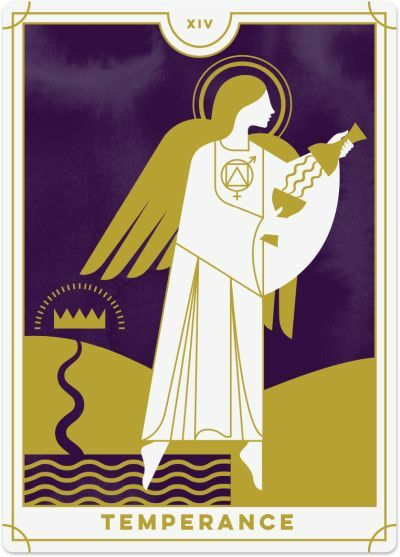 An upright Tarot card represents ‘externally expressed energy’. 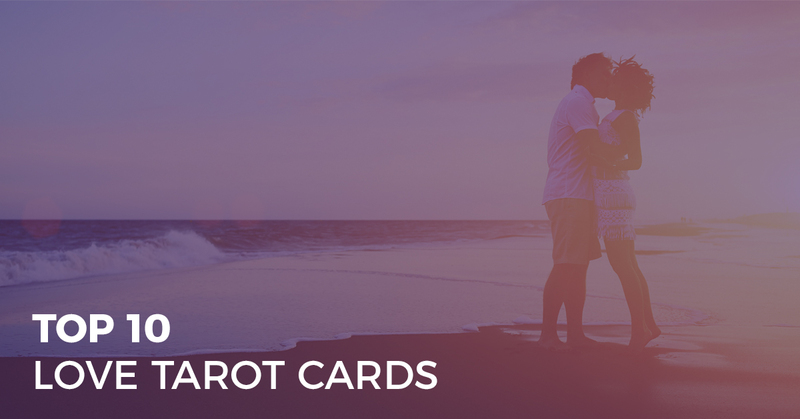 That is, the energy of that Tarot card is expressed outwardly into the world and is experienced in your external environment and in your relationships with people and situations. On the other hand, reversed Tarot cards are internally expressed energy. That is, energy that is held within ourselves or that is more private or even secretive. For example, the upright Empress may represent taking care of others, whereas the reversed Empress may represent taking care of yourself. To simplify the method, take the upright meaning of the Tarot card, and then add “self” or “private” to the interpretation. What I love most about this technique is that there is no ‘good’ or ‘bad’ message here (unlike the traditional reversed card meanings which focus on the opposite of the upright card meaning). It’s simply where the energy is being felt. This technique can also show where changes need to be made or where action needs to be taken. If your Tarot reading is mostly upright cards, then you know you’re dealing with external situations and your relationships with others. If your Tarot reading is mostly reversed cards, then you know you’re dealing with yourself and any required actions or changes need to happen within you first. Reversed Tarot cards can often point to an imbalance in energy. That is, there is too much or too little of the energy. Take the Queen of Wands, for example. Upright, she represents a confident person who enjoys social situations. However, what does this look like when there is too much or too little of this energy? Perhaps she is over-confident and domineering, especially in social settings (too much of the Queen of Wands energy). Or perhaps she is a wall-flower or a ‘shrinking violet’ when in a room with others (too little of the Queen of Wands energy). This method is similar to the ‘too much or too little’ energy, with a slight difference. Energy can often appear in our lives, but it gets blocked or isn’t being expressed in the most constructive way possible. 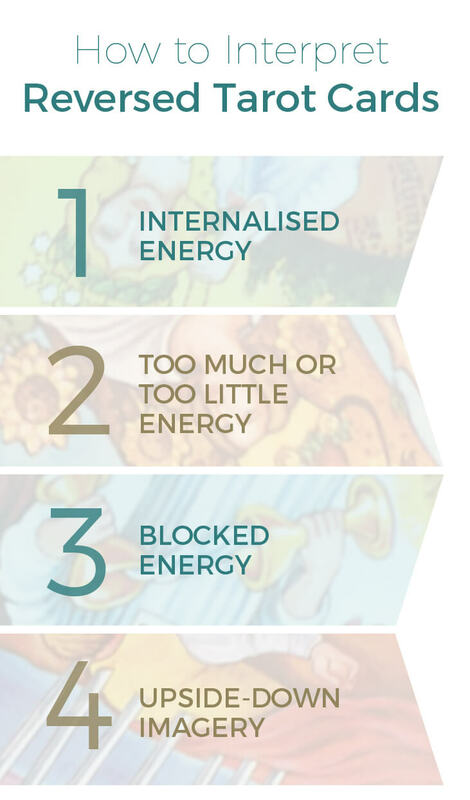 For example, the reversed Temperance card may indicate that you are seeking out moderation and harmony in your life but right now, there’s a blockage to fully experiencing that energy in a positive way. Ask, “What’s getting in the way of you achieving moderation and harmony?” That is, identify what is blocking the energy. Then, ask, “How can you release any blockages associated with moderation and harmony?” Perhaps you need to reconnect with the mantra, “Everything in moderation”. Perhaps you need to pick your battles to create more harmony. Perhaps you need to let go of the expectation that there will always be perfect harmony in all things. To find the answers to these questions, you may simply have an open dialogue, or you may pose these questions to the Tarot to see what comes up. I love working with the pictures in the Tarot cards, especially when I want to connect more intuitively with the situation. If a Tarot card appears in the reversed position, look at the imagery of that upside-down card and see what comes to you intuitively. For example, in the Ten of Swords reversed, it appears as if the swords are falling out of the man’s back. Perhaps the pain that has been inflicted in the past is now finally being released and the client can move forward into a new cycle (especially since this is a Ten – the end of a cycle). Or in the reversed Page of Pentacles, the coin looks as if it might slip out of the man’s hands. His grip is not very tight and he doesn’t seem to be concentrating. Perhaps it is a sign that without the necessary discipline and focus, money is just slipping out of your hands. This is a particularly powerful technique for interpreting reversed Tarot cards, especially if you’re a visual person. The images often create an instant link between your conscious and unconscious mind, helping you to connect with your intuition. So there you have it – 4 of my favourite methods for interpreting reversed Tarot cards. 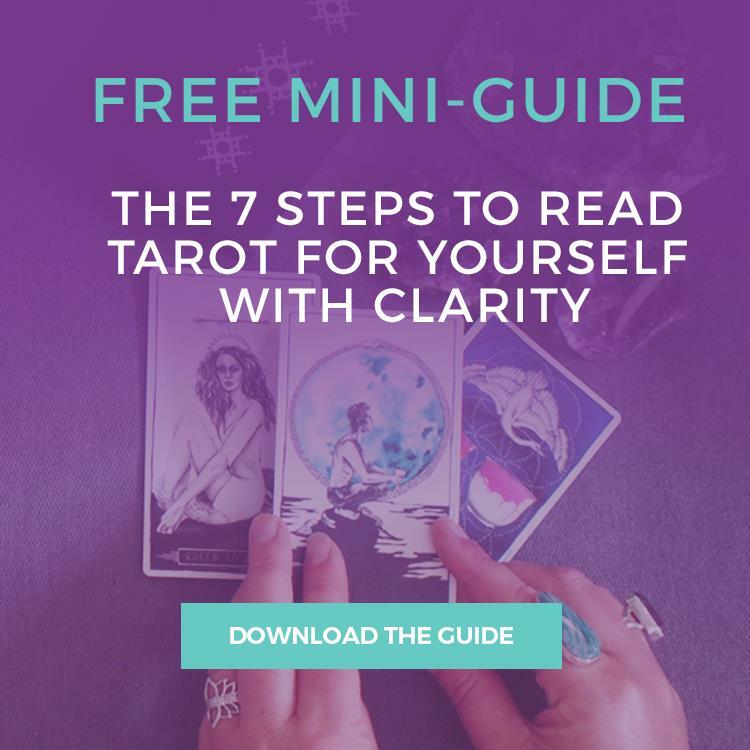 If you want to truly master the reversed Tarot cards and learn not just 4, but all 8 methods, then you’ll love my online Tarot training program, Master the Tarot Card Meanings. In my signature program, I’ll show you how to interpret upright and reversed Tarot cards from the heart, not just the book. And I’ll teach you the ‘must know’ systems that sit behind the Tarot cards that make learning Tarot super easy. By the end of the program, you’ll have what it takes to become a confident and intuitive Tarot reader who everyone raves about! How Do You Know Which Method to Use? This way, the Universe will present your message to you through the most relevant cards, given that you are interpreting them in a certain way. Sometimes you just ‘know’ what the card refers to. Your intuition may be guiding you towards a specific interpretation, or you may be drawn to a combination of interpretations as listed above. Look for themes across the different cards in the spread you are using. For example, the Four of Cups reversed combined with the Hermit may suggest that your client is spending too much time alone and shut off from the world around them. 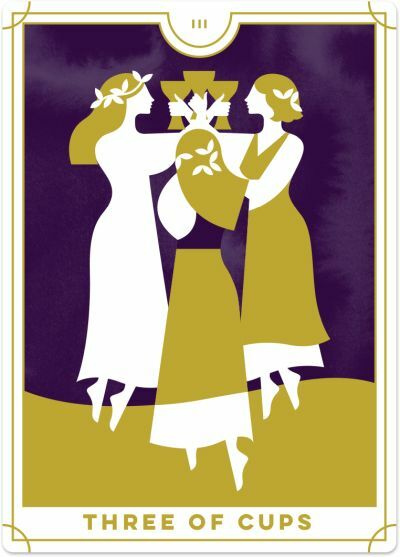 On the other hand, the Four of Cups reversed combined with the Nine of Cups reversed may indicate that your client has lost their connection with their inner selves and exterior opportunities are also unfulfilling. Sometimes, it really does just come down to experience. For example, I know now that whenever I see the Three of Cups reversed in a relationship reading, nine times out of ten it indicates that there is a third person involved and it is usually the client who is that third person. To help you build your own experience, seek feedback from your clients to understand how the cards are playing out in their lives. Do this not only during or directly after the reading, but also a few weeks or months later. Find out how a particular card came to life for you or your client and understand what it looked and felt like. Now that you have 4 simple yet powerful methods for interpreting reversed Tarot cards, let’s get you reading with reversals straight away! 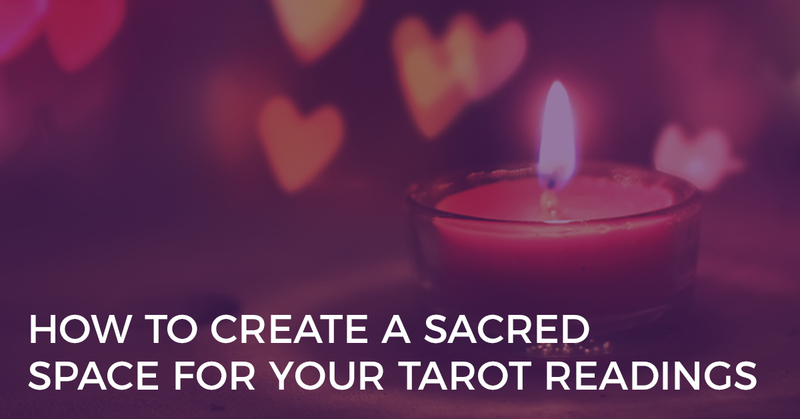 First, you need to decide if you are laying out the Tarot cards to face you or your client. There’s no ‘right’ answer – simply choose what feels right for you. But, make sure you decide before you start to lay out those cards so you know what’s upright and what’s reversed. My preference? I like to read the cards facing me and then I’ll show the client the cards as I talk about them. Next, you need to get some reversed cards into your Tarot deck. My favourite method is to cut the deck into three piles. Turn one pile from top to toe, 180 degrees, so that those upright cards will become reversed cards, and vice versa. Then put all the piles back together and shuffle. Then do the reading. Or you might prefer to do a ‘messy pile’ shuffle by spreading the cards out on a table haphazardly and moving them all around before picking them back up into a neat pile. Or something else! Again, there is no ‘right’ way of shuffling. Choose what feels best to you. Now you’re ready to rock ‘n roll with reversed cards in your reading. And if you want to take your Tarot readings to a deeper, more profound level, check out my online Tarot training program, Master the Tarot Card Meanings.